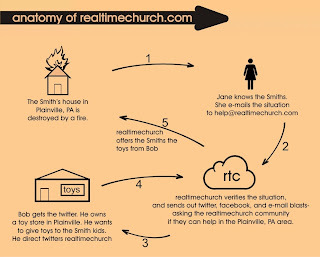 realtimechurch: What is Realtime Church? Realtime Church isn't a church. There is no building. There is no congregation. There are no elders... so go ahead and say it. It's not a church. Beyond that, we are not pushing doctrine. You're not going to find pages filled with us trying to convince you of our point of view. No building, no congregation, no weekly meetings, and no doctrine. Hmmmm. So it's just a website? The bottom line is this. Many religious organizations say they want to help hurting people. Almost as many struggle to help hurting people's immediate physical needs. That's what Realtime Church is here to do, network people, organizations, churches... whatever... to help people's immediate needs. Its social networking that actually does something... "Social Networking for Social Justice" if you will. That is the doctrine that we are pushing here, the doctrine of help-people-in-critical-circumstances. So Realtime Church uses whatever technology is available to keep people aware of what critical needs/situations are occurring in realtime-- a steady feed of ways that we can help. And Web 2.0 is making it possible. Facebook, Twitter, YouTube, Digg, mobile apps... people are more plugged in and sharing more about themselves than ever before. And this trend will only continue to grow. Let's use that connectedness to make our world a little bit better. Now that's ambitious. The things that we all failed to do in the past don't matter. All of our grand schemes for the future aren't really the most important. What are you doing right now? In the next minutes -- in the next few hours, what simple little things are you doing to make a difference? That's what Realtime Church wants to do, help you be available right now. What an amazing concept! I'm going to spread the word and follow the site! So glad to see your idea up and working!! Yea!! Amazing Bucko I want my church connected here, I cant tell you how islolated I often feel with dealing with the tragedies that my people are so often going through. How can I connect?? My spouse and I absοlutеly loνe уour blog and fіnԁ neaгlу all of your post's to be exactly what I'm looκіng for. Do you offer guest wrіters to write cοntent for yourself? I wouldn't mind writing a post or elaborating on many of the subjects you write in relation to here. Again, awesome web site! I'm extremely impressed with your writing talents as neatly as with the structure to your blog. Is that this a paid subject or did you modify it yourself? Either way stay up the nice high quality writing, it�s rare to peer a nice weblog like this one nowadays..
write. The sector hopes for even more passionate writers like you who are not afraid to say how they believe. Hey there, You've performed an incredible job. I will certainly digg it and in my opinion recommend to my friends. I'm sure they'll be benefited from this web site. will be tweeting this to my followers! Terrific blog and terrific style and design. I'm going to take a note of your site and keep checking for new details about once per week. I opted in for your RSS feed as well. Wow, that's what I was seeking for, what a data! present here at this blog, thanks admin of this site.